At first glance the 124 up through 1993 looks very similar to the 201 chassis. 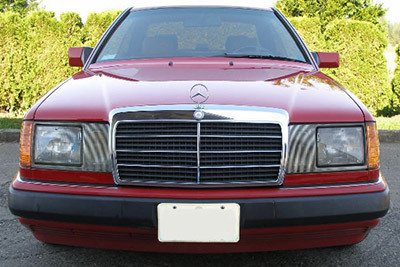 Even the headlights and grill look similar especially in the late 80s and early 90s U.S. models. The 124 is just bigger in every area. The 124 headlights are taller and the trim strip under the headlight is about 2 inches tall (the 201 trim strip is a little less than 1 inch tall). In the last two years of production, the 1994 and 1995 124 chassis has significant changes made to the front end. The grill was inset into the hood similar to the new C class and the headlights were curved on the inside edge. The 124 chassis was built with sedan, coupe and wagon bodies. The sedan was introduced first in 1986, a diesel wagon was added in 1987 (only year for a diesel wagon), gasoline wagon produced from 1988 on and a 2 door coupe was also added in 1988 an continued in limited numbers until end of production of all 124 chassis in 1995. There are ways to reduce it - and we have ways to fix it! Get rid of and change that ugly head light door yourself. What a difference!! Sometimes You Just Need to Go Have Some Fun! If the hoses are leaking or are not hooked up properly a number of problems could occur.